You can choose your Christmas delivery date at the checkout and delivery is free to most areas. This is a beautiful bonsai with an elegant trunk flow. A premium range gift which is supplied with matching ceramic drip tray, pruning scissors, bonsai fertiliser, care instructions, Merry Christmas log pick and Chinese Figurine. A wonderful Christmas gift to delight friends or family. An inspired gift which is fun & artistic. A very pretty Oriental Tea Tree bonsai with lovely trunk flow and open structure. This is a premium range bonsai with matching ceramic drip tray. 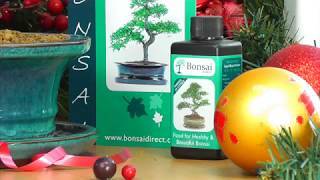 A wonderful Christmas present and includes bonsai feed, bonsai pruning scissors, care instructions, Merry Christmas log and Chinese figurine. This bonsai has dainty white star like flower. Very tasteful. * Pot details: Fresh turquoise rectangular ceramic bonsai pot.